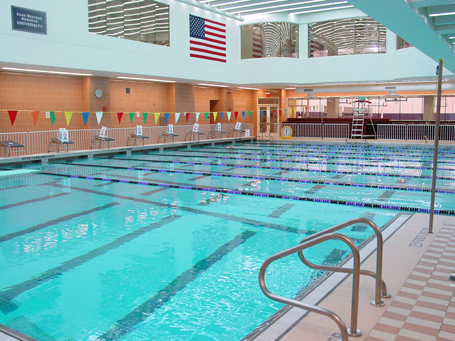 New York University called on the team of Kevin Roche John Dinkeloo and Associates and Counsilman-Hunsaker to design a world-class natatorium for hosting university aquatic athletic events and aquatic fitness programming for students. The Bobcats new natatorium, located in the Palladium Athletics Facility, is the main venue for NYU’s swim athletes to train and host swim meets. The pool’s highly functional design consists of a 25-yard by 25-yard “L” shape layout.